inspirEDucation « An aspiring educator and educational activist's journey through the challenging and complex but rewarding and inspiring field of education. Welcome to my education blog! My name is Hannah Nguyen, and I'm an 18 year old sophomore at the University of Southern California in Los Angeles. I am the chapter leader of Students United for Public Education - Los Angeles (SUPE-LA) and a national organizer for SUPE with my good friend Stephanie Rivera. I'm an aspiring teacher who believes in revolutionary ideas over reform, and that's why I'm also passionate activist for educational justice. I hope my posts bring you enlightenment, provoke your thoughts, and empower you join the fight for educational justice as well! Today, I was offered $1,000. By Teach for America. March 5, 2014 6:26 am / 6 Comments on Today, I was offered $1,000. By Teach for America. As you all may know, I’ve been very busy recently putting together a student-led education conference for youth in LA called EmpowerED: Los Angeles Student Power 2014. I’m incredibly excited for this event, but have been struggling to raise money to fly in student organizers from all over the country. So I’ve been running a crowd-funding campaign to get the funds to make this personal dream of mine come true. Right now, I am a little less than $1000 short of my goal. Let’s backtrack to a few months ago, when the ideas were still brewing in my mind. I knew that I wanted to provide a space for students to elevate their student voices and organize together for educational justice, but I wasn’t quite sure how at the time. Also during this time, my organization, Students United for Public Education, an entirely student-led, grassroots organization that defends public ed and believes in elevating student/community voice in the struggle for #edujustice (not #edreform), had just launched its first campaign: Students Resisting Teach for America. After I started participating in the #resistTFA campaign a few months back, TFA folks started to reach out to me to speak with me about the campaign. They were all very respectful, very amicable, and very open to my ideas. We formed friendships, despite our differences in opinions about TFA, based on our mutual passion for education. Like I always say, I don’t automatically hate everyone in TFA. I know there are genuinely passionate and caring individuals in the organization; I’m even friends with a few of them. With them, I shared my story, my reasons for doing the work that I do, and what I fight for in education, which included my vision for elevating student voice through the EmpowerED conference, a vision that is now coming true by the end of March! …but careful. I trusted them, but I couldn’t trust the organization they was a part of. I told them that right now, my biggest problem was funding, but I could not (for paperwork reasons) and would not accept funds from any organization (in my mind: especially not TFA). Support had to come individually, from people who were personally standing by the cause. I shared with them information that I had shared with all of my friends/colleagues who I had reached out to in the past to help me spread the word and raise funds through my crowd-funding campaign. To be honest, I didn’t think much would come of it. Crowd-funding has been very exhausting, and I’ve reached out to so many people, with very little outcomes. Needless to say, I was in a desperate position as an organizer. Now today, I get a call that I will be getting $1000, enough to meet my goal for the EmpowerED conference. I was ecstatic. But then I was told that I had to take off the embedded SUPE facebook page on the EmpowerED website, because there were posts about #resistTFA there. And that’s when I realized that this money had strings attached, as it would be, despite my previous requests for individual donations, coming from the organization itself, an organization that I resist for very deeply personal, complex, and unique reasons. I am ashamed to say that I was tempted. Of course, I was tempted. This money, as dirty as it was, would save me so much time and energy trying to raise the remaining $1000 on my own, or trying to make my event work with $1000 less than I intended. I was in a desperate position, but I ultimately decided, a few minutes after talking to them and thinking it through, that I could not accept the money. I refuse to accept money from a corporation that is funded by those who contribute to the destabilization of so many communities. These communities are home to the students who will be featured at EmpowerED, students who have made history by coming together with their peers and fighting back against injustices like school closings, high stakes testing, budget cuts, and charter expansion, all of which TFA has had either a direct or indirect role in causing/perpetuating. How could I take their money? This money was Walton, Gates, and Broad money. This money was made off of the backs of workers and poor communities. This money was behind the oppression of my people. So, no. I will not be accepting $1000 from Teach for America. Because I cannot be bought. If you are an individual who supports student voice in education, please make a donation to EmpowerED 2014. We have to take care of our own. This money will be going directly to a truly grassroots, student-led event that will revolutionize education through the student power movement. 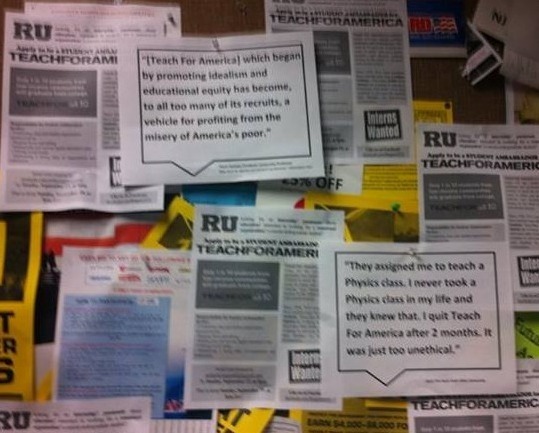 Not the corporate, top-down education reform movement. On October 1st, we will be announcing our official launch, but before then, we’ve decided to hold a fundraiser to support our campaign, since we are a completely grassroots, student-led org with little to no funds. In about 3 days, we’ve successfully raised over $1200 thanks to the generosity of so many justice-minded educators, parents, and students. We are so grateful to everyone who is helping make this campaign happen, but we’re not done yet! We still need your help to reach our goal of $1650! So please, if you can and if you haven’t done so already, please donate to this campaign. I promise that we at SUPE are working tirelessly to make sure that your donations have a very large impact. If you are a college student interested in starting this campaign at your school, or if you’re anyone who wants to stay up-to-date with the campaign, please fill out this form to receive regular updates and/or a comprehensive campaign tool-kit! 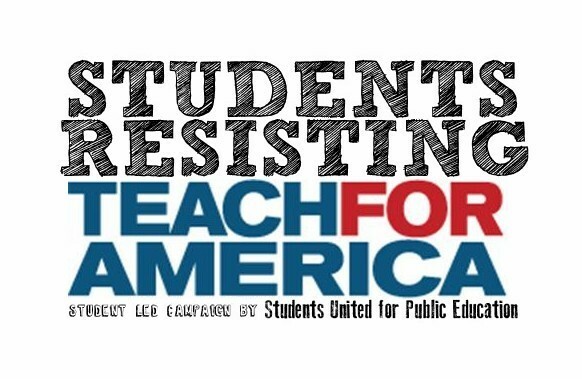 If you are a student or TFA alumni who wants to share your story on why YOU resist/oppose Teach for America’s actions and corporate interests, please fill out this form! For years, college campuses across the country have been the core recruiting ground for Teach for America (TFA). For many soon-to-be graduates, concerned as they should be with the rampant inequality embedded in American public schools, TFA appears to be an opportunity to make a difference. Using the rhetoric of civil rights and egalitarian politics, TFA promises ambitious college students that their hard work and good intentions are a crucial component of what it will take to fix the crisis within our education system. Yet, as numerous TFA alums and professionals have made it increasingly clear, rather than fighting inequality, TFA actually promotes it. The high-need schools in which most TFA corps members teach demand the most experienced teachers, not the least. TFA’s five-week-long summer institute, insufficient to prepare any new teacher, is therefore not only inadequate preparation for corps member teachers, but also unjust for the public school students who deserve nothing less than a fully-qualified and experienced instructor. In today’s political climate, however, where many urban school districts are conducting mass layoffs and cutting teacher benefit packages, such experienced teachers are becoming increasingly rare. Here too, TFA is partially to blame, as in many of the same school districts where experienced teachers have been laid off, TFA recruits have come in to replace them. Since most TFA teachers do not stay in their schools beyond their two-year commitment, they are far less likely to demand the higher pay and benefits, and thus stand as an attractive alternative, from the districts’ perspective, to career teachers and their unions. Increasingly across the country, college students are becoming aware of TFA’s role in perpetuating inequality in our schools. Our task now is to challenge the legitimized recruiting position that TFA enjoys on many of our college campuses, both by raising awareness and taking direct action. And we know we can’t do this alone. That is why we–Students United for Public Education (SUPE)–will be launching the first national student-led campaign against Teach for America. Distribution of campaign tool-kits (via PDF) to students at different campuses interested in participating.These tool-kits will include flyers, different tactics to approach/bring awareness about TFA on their campus, etc. 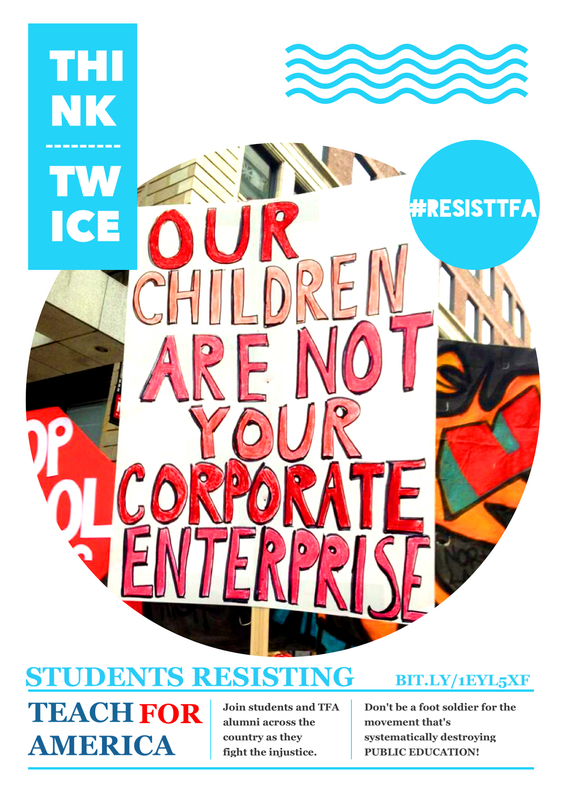 Creating a website about our campaign along with different resources and articles in which students can learn more about the resistance against TFA from not only students, but TFA alum, teachers, and other professionals. Providing prospective TFA corps members with testimonies (from students who oppose TFA/chose not to do TFA and TFA alumni who now oppose the organization) so they can make an informed decision. Other ideas are still welcomed! In order to effectively run this 25-day long campaign (October 25th is their next application’s due date), we do need funds of some sort (after all, we are just college students!). Below is listed where your funds will be used. We will be transparent on how each dollar is spent throughout the campaign, and the funds that aren’t used by the end of this campaign will be deposited into our SUPE General Funds. We thank you all in advance for your support, and we look forward to our official launch date on October 1st. Highlights from Terri’s Alabama Teacher Town Hall video – A MUST WATCH! September 17, 2013 4:19 am / 1 Comment on Highlights from Terri’s Alabama Teacher Town Hall video – A MUST WATCH! in a bad camera angle). The security guards threatens to remove her. is black, with just audio. claimed that the money was there after all. the case, hire back the teachers. family… the picture speaks for itself. with data from Jon Pelto’s website. Terri has also reported that the local news has covered the protest that occurred outside before the event. They did a pretty poor job of it, but that just means they’re afraid of the truth. In other news, the Philly Teacher Town Hall happened today… From what I could gather one twitter… it got pretty heated. No sign of a large action/protest yet. If you have any info about what happened, I’d love to know! Thanks! 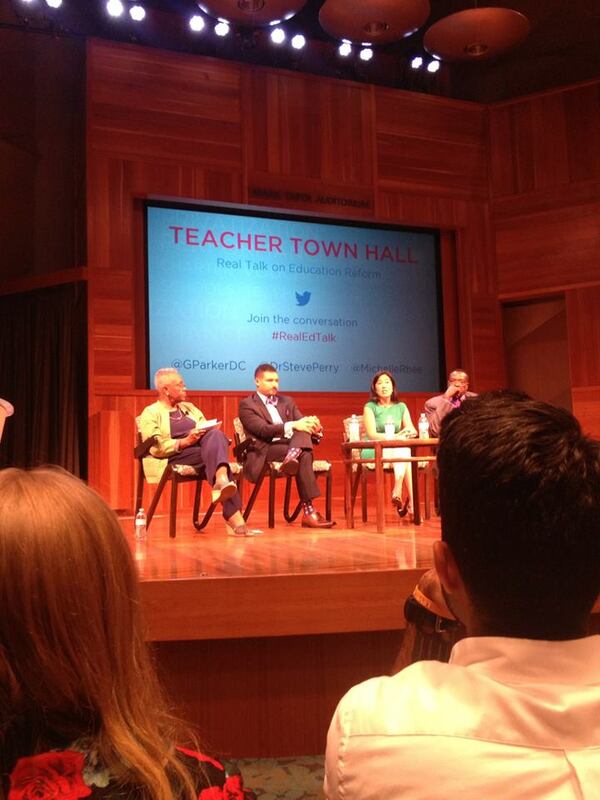 Brave Alabama BAT speaks out at Michelle Rhee’s #RealEdTalk…Your move, Philadelphia! 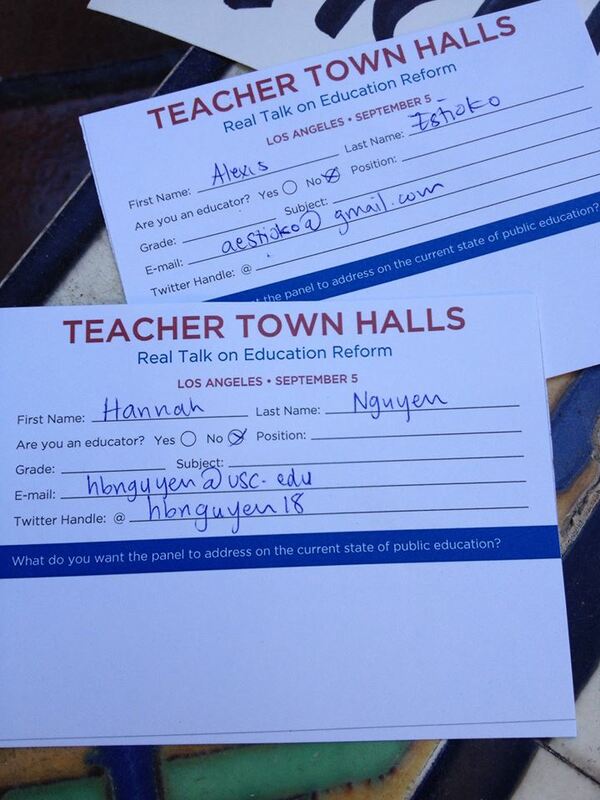 September 16, 2013 3:47 am / 3 Comments on Brave Alabama BAT speaks out at Michelle Rhee’s #RealEdTalk…Your move, Philadelphia! Last Thursday, Michelle Rhee and her cronies, Steve Perry and George Parker, made their next stop on their three-city Teacher Town Hall tour in Birmingham, Alabama. I had a sliver (a minuscule sliver) of hope that this Teacher Town Hall would be less disastrous than the first that I experienced last week in LA. I was proved terribly wrong. The video above was taped in secret by Terri Michal (@Free_2_B), a wonderful Alabama BAT who is committed to defending public education in her state and who bravely confronted Rhee & Co. last Thursday. She voices her concerns in the video at 3:34 but be sure to watch the whole video; as nauseating as it is to hear the panelists talk mindlessly about issues they know so little about, Terri adds amazingly helpful commentary that exposes the truth behind their propaganda. Terri Michal’s sign that she unfurled while the panelists “answered” her question. Go Terri! I had been in contact with Terri over the past week since she saw the video of my speech, and I had been helping her prepare for the Teacher Town Hall in Alabama, so that she could make sure that her voice was heard. I am very excited to read her full report on the protest both outside and inside the event. She was one of the few outside protestors who attended the event, and I am very glad that she did and that she fought to have her voice heard. I am, however, equally horrified at the panelists’ and moderator’s (who I believe is Rhee’s husband? correct me if I’m wrong) responses. The bullying and intimidation tactics in this video on the part of the panelists is absolutely revolting. The tactics they used to silence the opposition is ridiculous (though not surprising). Their avoiding to answer the questions is utterly embarrassing. Almost everything the panelists said in this video were the same exact talking points that they used at the last event. Rhee even mentions me at 2:13, and completely twists her encounter with me, not-so-ironically while I am not there to defend myself (Terri’s commentary tells the TRUTH that I reported to Terri over twitter). Typical reformy tactics. They can dish but they can’t take. This event was just as controlled, manipulative, and oppressive as the last. I can’t say I’m surprised at the reformers, but that doesn’t make me any less disgusted. Thank goodness for the brave people in this video who fought to have the true voices of those in the Birmingham educational community heard! Tomorrow, Rhee’s next stop will be in Philadelphia. I am way too excited to see what will happen there. I’ve been in contact with the Philly Student Union and they have confirmed their attendance. Diane Ravitch might also attend since the event coincides with her book tour. With the recent state of public education in Philly amid drastic budget cuts… the event should be nothing less than interesting… Stay tuned! Students, if you will be attending the event, I just want you to remember that NO ONE can tell you what’s best for you. You have the power to think for yourself and have a voice in your education, and you shouldn’t let ANYONE (no matter how much great-sounding propaganda they throw at you) take that away from you. Everyone else, please spread this Terri’s video like fire! This is SUCH an important piece of the truth, especially with Terri’s amazing added commentary on the video. 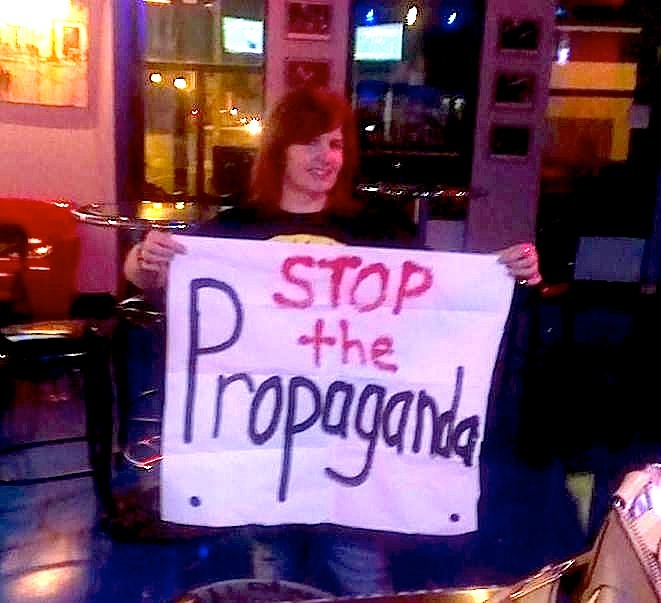 We cannot let Rhee and her cronies get away with the dangerous propaganda they spread! …but my main point is: listen to the students. LISTEN TO THE STUDENTS. Education belongs to the STUDENTS. It is students who are getting the education and it is the students who should have a say in what that education looks like. My biggest problem with reform is that people like you three, who have all this corporate power and money, get to sit up on these physical and political stages and either implement or support policies that affect classrooms and communities that you’ve never stepped into or even bothered to listen to. You haven’t even bothered to listen to these dedicated teachers in these past two hours! I had to fight for my chance to speak because this so-called “conversation” was just two hours of you all defending your views through a series of straw man arguments. How dare you speak for people you don’t wish to truly listen to? How dare you talk about the “students’ interests” when you have not listened to what students all over this country are saying? How dare you talk about “high expectations” when you obviously don’t expect that students are capable of thinking for and fighting for themselves? How dare you talk about “choice” when you don’t give students any choices in what and how they learn? How dare you talk about “every student” when you refuse to acknowledge and honor the complex humanity of our each and every student? How dare you talk about “accountability” when you can’t even hold yourselves accountable for the disastrous effects your reforms have had on communities everywhere? Students are not data points on a graph you can talk about but never listen to. They are humans with hearts, minds, and stories of their own. They are resilient and beautiful and insightful. They deserve better than high stakes tests that don’t capture their humanity, better than charters that exclude and criminalize certain youth, better than the poverty that creates an opportunity gap well before they begin school, better than limited curriculum that doesn’t allow them to explore other options, better than policies that instill fear and oppress critical thought, better than budgets that leave their schools and classrooms dilapidated and unbearable, better than decisions that are made without their input. We can do better than current reform. We can do much better because our youth deserve much better. Educational justice will not be achieved by top-down approaches that deliberately silence the voices of those at the bottom. It will not be achieved by policies that exclude, divide, and oppress. It WILL be achieved by PEOPLE working with and fighting with the students who live this everyday reality. 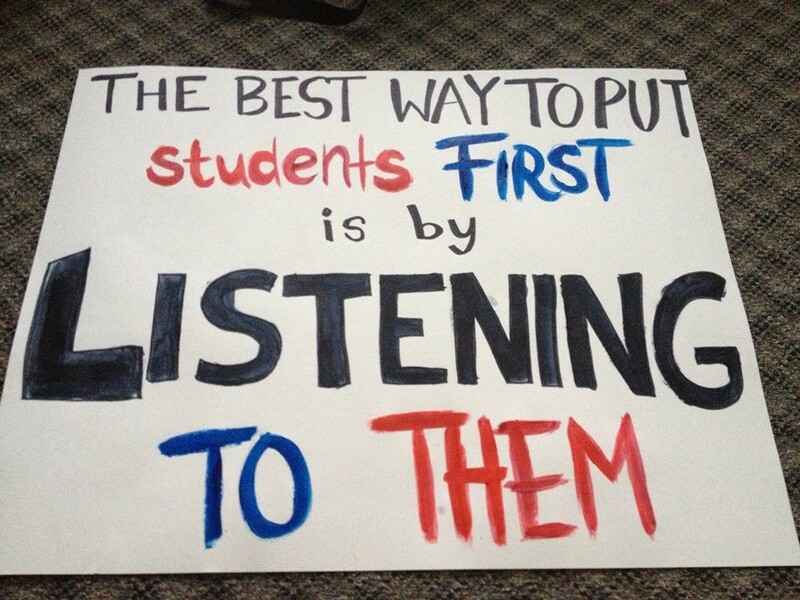 The best way to put “Students First” is by listening to them. So walk your talk and start listening. Michelle and I after the event when she spoke directly to me. Taken by Alexis Estioko. Last Thursday, I met Michelle Rhee for the first time. After months of writing about her, researching her, and reading her book (which I couldn’t finish out of boredom), I finally got to see in person the woman I once adored and now completely mistrust. Not only that, but I got to speak directly to her. Needless to say, it was quite an interesting encounter. Thanks to my network of support on and off line you’ve probably already heard about the speech that I gave to Michelle Rhee, Steve Perry, and George Parker during the Los Angeles Teacher Town Hall. But a lot went on before and after that I would like to bring light to now, especially for the folks who plan to attend the Teacher Town Halls in Birmingham, Alabama on 9/12 or Philadelphia on 9/16. Please use my experience to help you plan some sort of resistance. We need our voices to be heard. In summary, the event was a complete disappointment. I came in expecting a vibrant and balanced discussion with equal opportunity for both sides to speak. After all, the word “conversation” was on the screen behind the panelists the entire night. By the end of the night, I seriously wondered if they even understood the concept of a conversation at all. I also bought masking tape that I planned to put over my mouth during the event. I meant to allude to the incident where Michelle Rhee taped the mouths of her 1st grade students. When I arrived, I was greeted by members of United Teachers Los Angeles (LA’s teachers’ union) who were passing out flyers and holding up signs outside the library where the event was held. One of them was my friend Noah, who I met a few weeks back and am currently working with on a campaign called Schools LA Students Deserve. I also met the one and only activist teacher Alex Caputo-Pearl, who was recently fired from Crenshaw High for leading an educational program that taught students to *gasp* think for themselves and learn through a social justice/civic engagement lens. His story and the stories of the students who fought to save their school are phenomenal. When I asked if the questions would be filtered, the lady told me that the questions would be grouped by topic and they would try to get through as many as they could. As I was in line writing my question, my poster was on the ground next to me. A security guard came by and told me I could not bring it into the event. So I folded it up and stuck it in my backpack. There were about 200+ people in the room. From what I could estimate from the applause after certain talking points, at least 80% of the room was pro-corporate reform. Security guards lined the perimeter. I felt highly policed. The panelists were welcomed onto the stage. I have my opinions about each… but you can go research them for yourselves. The moderator then laid out the ground rules for the event. She would say the name of the person whose question card she was holding. That person would be given exactly 2 minutes to speak to the panel and ask their question. The panelists then would be given unlimited time to answer. Later on, I realized that this only applied to people who disagreed with corporate reform because the music of the reform-opponents was barely even allowed to be played. Only 16 question cards were in the moderator’s hand to be answered. Only 8 questions were answered. My question was not chosen to be answered as I expected. TWO of those 8 questions were considered “controversial” (by their standards). The rest were in the “policy-related” category but for some reason all went back to the matter of teachers unions. Panelists (who were all in general agreement on the issues) spoke for 95% of the time. Those who asked questions were not allowed time for rebuttal. Steve Perry even had the nerve to say that battling child poverty “isn’t even necessary!” and brush off a point about English language learners. I guess the only students that matter are those who can take tests. The rest of the questions basically gave the panelists the opportunity to elaborate on their points of view. Topics covered were: Waiting for Superman (lol), unions, tenure, testing, charters, and vouchers. It was mostly a union-bashing party with little productive or balanced discussion of how we move forward or how we can work together. The ONLY good point brought up by the panelists was that “bad” charters should be held accountable. Absolutely no thorough discussion of concrete topics like Common Core, NCLB waivers, curriculum, teacher prep/training, student-centered learning, critical pedagogy, or alternatives to testing. Steve Perry even had the nerve to ask “why don’t people who oppose testing ever provide alternatives?” without giving the audience a chance to speak (I have a great answer for that question) OR proposing any alternatives of his own. What a Grade A “educator”. Actually… there was no thorough discussion with substantial data support whatsoever. Everything was vague and shallow (“success”, “all students”, “high expectations”, “accountability”), full of false dichotomies, sweeping generalizations, and logical fallacies. I gave up counting after about an hour of 37 total fallacies. After I spoke, the moderator brought the event to a close, with no public response to my speech from the panelists. Right after the event ended, as I was ready to cure my headache with a nice grilled cheese sandwich from my favorite food truck, Michelle Rhee approached me and wanted to speak to me personally. 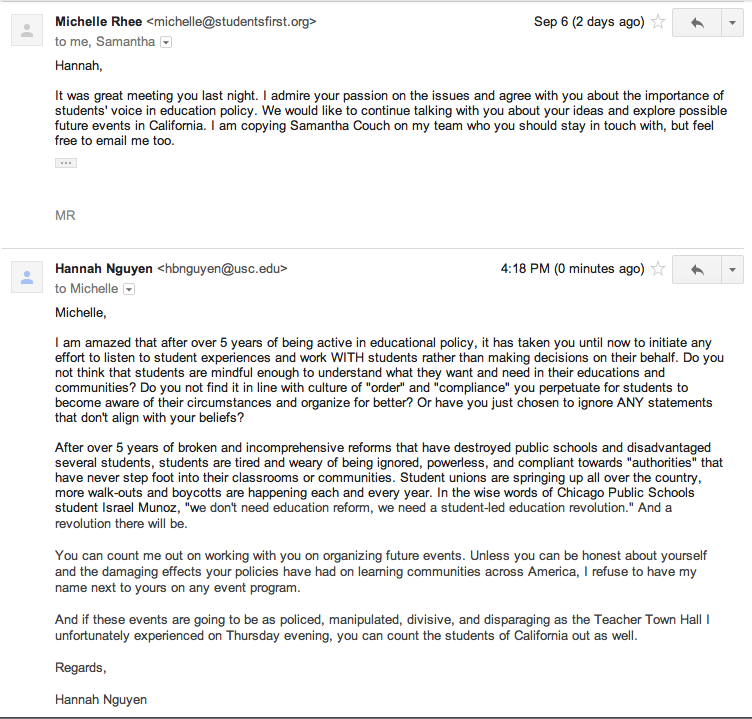 She gave her response to my speech, only focusing on my point about charters. She mainly talked about funding for charters and claimed that students in public schools are funded more than students in charters. When I brought up the point about charters being funded by private billionaire donors and corporations, she questioned why public schools don’t ask for grants so they can be funded like charters. Let's start with… THEY SHOULDN'T HAVE TO. And then: they're busy trying to teach students in difficult conditions thnks 2 charters! I was then asked by StudentsFirst to do an interview. In the interview I basically just expanded on the importance of listening to students. If you are going to the Teacher Town Hall in Birmingham on 9/12 or Philadelphia on 9/16, PLEASE invite students to come and tell their stories. Chants work well. Posters work well. Collective actions and gestures are most powerful. This is not the end; we still have a long way to go before education is put back into the hands of educators and students. This event does not have to be as one-sided and manipulated as it was for me. You can demand your right to have your voice heard. You can turn the discussion around. This is an opportunity for a meaningful action that will shine a national light on the opposition to the corporate education deform movement and could spur a discussion on alternatives to this movement that promote true educational justice and equity. Do not let them speak for your students and children. Do not let them play victim and use straw man arguments to promote their views. LET YOUR VOICE BE HEARD! GO AND SPEAK OUT! I’m just posting the video here so that people can connect the video to my blog and vice versa. I will be posting a lot of important things on here soon, so please stay tuned. Unfortunately, our fight for public education does not end here. The fact that I got a chance to speak was a stroke of luck; there are millions of student voices across the country that are being silenced under corporate reform, most of which will never have the chance to be heard unless we ACT NOW. We cannot continue to let Rhee & Co. exploit and speak FOR students. LET STUDENTS SPEAK FOR THEMSELVES! If you will be in Birmingham on 9/12 or Philadelphia on 9/16, I STRONGLY URGE you to come to the Teacher Town Hall and let your voices be heard. They will make sure you are silenced but you MUST do whatever it takes to speak truth to power. Also, invite students to come and speak. Youth engagement is VITAL if we are ever going to win this fight. Educators, continue to EMPOWER and ENCOURAGE your students to take charge of their education and rights. We are strongest if we fight WITH the students! Thank you to Vincent Precht for taking this video (apologies once again for making you move every time I went in and out of our row) despite the tight security in the room. Thank you to my sweetheart Alexis Estioko for coming to this event with me, sitting by my side supporting me, and always giving me the strength to do the right thing. I love you more than words can explain. Thank you to my little brother, who I miss every day and who gives me the strength to fight for him even when it’s hard. Thank you to Stephanie Rivera for her beautiful friendship and inspiring mentorship. Thank you for teaching me what it means to be a true organizer for educational justice and for giving me the opportunity to pursue my passions through SUPE (Students United for Public Education). Thank you to EVERYONE who shared my video and sent me words of encouragement and support. Thank you for all that you do to celebrate your students and their humanity, and thank you for your steadfast dedication to justice and educational equity. I want to name you all, but that list would be endless. Expect to be featured on a page on my blog soon. I love you all. And finally, thank you to my fellow students, whose stories and experiences have made my blood boil with passion to fight, organize, agitate, mobilize and WIN! I believe that there are three key things you need to always do when leading a movement for social justice and change. Have the courage to speak out and act in the name of justice. Never forget why you do what you do and who you do it for, and make sure everything you do honors that. As you may know, I recently got back from the National Student Power Convergence at the University of Wisconsin-Madison. Words can’t even begin to describe how inspired and moved I feel. 5 days of meeting and connecting with student activists (including the wonderful and amazing Stephanie Rivera, Jacob Chaffin, Asean Johnson, and Israel Munoz), exchanging ideas and strategies on how to organize action around key issues affecting youth, and celebrating the power of student voice and action? It was seriously a dream come true. I wish I had the time to delve into every detail of every experience that I had during these 5 days, but I hope you take my word for it that the NSPC was life-changing and groundbreaking. With all that I’ve learned and all the new friendships I’ve made, I am so excited to take all that I have learned to begin building my very own chapter of Students United for Public Education (SUPE) in Los Angeles and well as working alongside my great friend and mentor Stephanie Rivera as a national organizer for SUPE. But I’ll be honest: as excited as I am, I’m actually kind of scared. I’ve spent most of my life doing what I love most: learning. And most importantly, I’ve devoted a lot of time to learning about myself, what I really feel passionate about, and how I could to contribute my gifts and talents. I never wanted to really act until I was sure of myself and until I understood the issues fully and deeply. And to be honest, I’m still learning, but since starting this blog, I’ve been starting to speak out and act. When I created this blog, I wanted to use it not only as a place where I could continue to learn and develop my thoughts, but to also speak up about my beliefs, raise awareness, inspire others to think critically about these key issues. Of course, I will continue to learn, listen, and grow for the rest of my life. It’s my favorite thing to do. But I feel like I’ve finally found my voice and I’m at a good place where I can begin to translate my passions, my thoughts, and my ideas into meaningful action and activism. Making that transition, stepping out of my comfort zone to put myself out there, is scary. But so far, what I’ve learned and how much I’ve grown has been more than worth it. Attending this convergence was a big first step towards action for me. One of my favorite experiences in this entire world (maybe even more than singing a solo on stage) is meeting people who care. People who have passion coursing through their veins. Who really care about something so much that they go out and do something about it. Who have the courage to stand up and fight for justice and what they believe in. Whose eyes light up and heartbeats speed up at even the slightest mention of something that makes them angry, hopeful, inspired, determined. Who are driven by love: love of compassion, solidarity, justice, freedom, and equality. These people are not only passionate; they’re revolutionary. They are the game-changers and change-makers. These are people who live and breathe that list at the top of the page. These are the people who have fought the fights and walked the talks. These are the people who have taught me what it means to be a part of the student movement, to stand up, speak out, and take action. I went to this convergence to do the first two things on that list that opened this post. I am here to learn from and listen to these amazing people and their stories. And from learning from those who have walked the talk and fought the fight, I hope to find the courage within myself to become more action-oriented, to continue to speak out against injustice, to immerse myself in my community, and work with and alongside others already doing great work to make a better tomorrow for youth. What I’ve seen happen often times (especially in… yup, you guessed it: the education reform movement), is that intentions start out good but the sword starts to swing the other way when money, power, and statistics are valued over the lives and humanity of students. “Kids first” and “For the kids” becomes merely rhetoric, as people jump to enact radically dangerous and untested policies that do anything but put kids first. It’s even scarier when these policies are put in place by people with power and money, because then they are blinded by their power and money and fail to see all the intricate parts of the matter. This scares me, because I believe my intentions are good, and the last thing I want to happen is for what I fight for to put students at a greater disadvantage. But I know that won’t happen, as long as I make sure that everything I do for my students stems from why I do what I do. I need my vision to be clear and for that vision, story, and root of my passion to drive me. I need to stay humble and true to my roots. So why do I fight for educational justice? Well for starters, I want to be a teacher. Every time I play that “nine lives” game at conferences where in each life you can choose any career you want, high school civics and social studies teacher is written in #1-9. But why do I want to be a teacher? Is it so I can watch people’s face fill with disappointment and bewilderment when I tell them my life’s ambition? Is it so I can work 2 other jobs to pay for my first job? Is it so I can have my impact measured by my students’ test scores? Is it so I can get weekends and summers off? The answer is simple: I want to devote my life’s work to inspiring and fostering young, bright, creative, and passionate hearts and minds. The thought of crafting creative and engaging lesson plans, bringing them to life in my classroom, sharing my stories and wisdom with young minds, taking my students to places they’ve never been (both intellectually and literally on field trips and such), and watching them grow into conscientious, open-minded, kind-hearted, passionate people excites me like no other. I’ve gotten a taste of it through working with children of all ages during my high school and early college careers, and I really cannot wait until I am finally fully trained and prepared to teach my own classroom. But why become active in educational policy and activism? Well the answer to that connects to what I want to teach and how I was taught. Let’s start with the latter. I am very lucky to have gotten the education that I got. It completely changed my life. As I’ve mentioned before in my other posts, I didn’t realize what learning was until I was exposed to a full, well-rounded curriculum that included the arts, humanities, and social justice education. Before, I depended on my high test scores to know that I was learning. Today, I know that no test score could ever reveal how much I had truly grown and learned through my education. For the first time, I was experiencing what I was learning, rather than passively regurgitating information that I barely internalized (something I’m really excellent at doing… I could be a professional test taker and that’s something to be ashamed of). I was finally opening my eyes to the intricacies and complexities of our global society and the field of education, and finally understanding concepts like solidarity, inequality, privilege, human rights, justice, and my role in all of these things. Social studies and civics woke my mind and heart and sparked such an immense passion in me that in my spare time, I found myself delving into the issues I studied more and more, as well as becoming more involved in my local community through organizing work and volunteerism. During this time in my life was when I found my passion in education, partly because realized the magic of education through my own transformational experience, and partly because I decided to write my sophomore year research paper on standardized testing and it shattered my long-held (arrogant) faith in tests as well as everything I thought I knew about education. As time went on, I slowly developed my biggest belief: that EVERY student should receive a free, quality, democratic, and well-rounded public education, unhindered by huge class sizes, dilapidated infrastructure, terrible working/learning conditions, inadequate funding, child poverty, high stakes testing, or other broken reform policies. I believe that this is a fundamental human right and true justice. This is why I am fighting for educational justice now. My education helped me find my voice and understand the importance of standing up for justice and equality for my brothers and sisters. When I look at the current attacks on public education, especially by a group of people I used to trust to improve education, I get this intense emotional reaction that mirrors the kind I would get in high school every time I read about or discussed a social injustice. My insides burn, my heart races, and every inch in my body longs to get up and do something because what is happening to students, teachers, and schools today is not reform; it’s destruction. I cannot possibly stand by while countless students are literally robbed of true education by neoliberals under the guise of “innovation”, “high expectations”, and “accountability.” I cannot possibly stand by while I hear my students’ stories of feeling unheard and powerless in what should be THEIR fight for THEIR education. I cannot possibly stand by while students continue to be silenced and invisible, their humanity reduced to digits and their futures determined by people who ignorantly implement harmful policies without considering student voice. I cannot possibly stand by while people who don’t want to devote a day of their life to educating a child use their money and power to manipulate and profit from a system they destroyed in the first place (Why is there a billionaire boys club? Oh right, because poverty and economic inequity exist and are silently hurting public education). I realize that I could not care about any of this, live a very easy life, float through grad school, get my teaching credential, and just be a teacher in a high school somewhere. I’m sure the reformies would love that. But I refuse to do that. And that has as much to do with how I was taught as it does with what I want to teach. I want to teach the things that made me a more open-minded, empowered, and justice-seeking person. I want to be a high school teacher of social justice and civic engagement. I believe that true education can and should awaken the mind and heart by fostering critical thinking (mind) and a commitment to social justice (heart). Yes, learning about all the terrible injustice and oppression that has marginalized groups of people throughout history is naturally discouraging, but I feel that there is also such beauty in looking at how the marginalized have historically risen up against their oppressors and fought for the justice and freedom from oppression. When students engage with learning material that relates to them and their cultural histories, they are more empowered to think and learn for themselves and take action. This kind of social justice education brings not only knowledge and enlightenment, but also hope for students. Hope that they too can not only live in a better world someday, but also be the reason for that better, more just and equal world. This is what I hope to bring to students. Hope. Light. A true sense of wonder for the world and love for those living in it. Motivation to learn and turn learning into positive action. A sense of empowerment. But how can I possibly begin to teach social justice in a system with so much injustice? I fight for educational justice because I believe that I myself have the power to contribute what I can now so that by the time my future students reach my classroom, the education system will be a more just place. I believe that empowered students like myself can and will stand up for what they believe is right and demand educational rights for all. I believe that education is liberation from oppression. I know I’m going to get a lot of opposition for fighting for what I believe in. Social justice education is equally liberating and threatening to authorities that pray for compliance. But I will not comply under policies and rules that put students at a disadvantage. I will not comply with people who wish divergent perspectives and beliefs be silenced. I will not comply until there is justice. Instead, I will continue to hope. Hope that I can not only teach in a better education system one day, but also be the reason for that better, more just and equal system. Hope to live my lessons now and one day have my lessons come alive.